To what does relativity relate? Before there can be relation there must be presence, and before a presence can relate to another presence, there must be a capacity for detection of some kind. Even collision of bodies should not be taken for granted in physics. It is a testament to our imagination that we can conceive of a universe that happens without any participants – with only there and then, but no here and now to put them in their place. What is required instead is an imagination of empathy, to trace the origins of our own consciousness not to the dots and dashes of information gathering instruments developed for our bodies to use, but to our own native information gathering capacities. Whether photons are really things or not, no model of the universe can be complete without fully explaining the relationship of photons to the phenomenon that we see as light. Whatever it is that we see cannot be excluded from any complete description of the universe. An early diagram of the MSR Theory of Everything suggests an equivalence of perception and relativity. Without getting too deep into the subject, it can be said that any discussion of relativity entails the use of a reference point, a so called ‘inertial frame’ within which phenomena tend to cohere together and share a common velocity. Even in a speeding train, the coffee in the cup can remain fairly settled on the tray in front of us. So long as the velocity of the train is maintained, we can’t tell by looking at the cup whether the train is stationary, or moving, or moving on top of another train which is moving even faster. Without this kind of orienting framing principle, there would be no ‘thing’ to relate to any other thing; no place to move toward or away from. Relativity requires an anchor, and for reasons which I will get into soon, the anchor of quantitative properties cannot itself be quantitative but must instead be perceptual in nature. General Relativity relies on Proprietary Relativity, aka, private perception. This should not be taken as an endorsement of anthropocentric idealism, or deism, or any other effort to fictionalize physical realism, but is instead a suggestion of pansensitivity with sense as both the universal law and the local participant. Relativity is anchored not only the law of inertia, but the consequences of it in sequestering physical tendencies into semantically stable ‘places’ which relate to each other, and through each other. This should be understood as a kind of sensitivity or awareness on the grandest, most public scale. It implies a translucence of mass and momentum in which the grandeur of events is implicitly and palpably present. Relativity refers to the underlying nature of place and pace as it is defined by matter and energy. 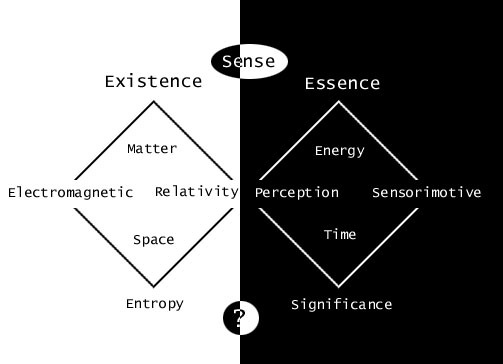 Matter and energy create the spacetime context by their relation with each other. The title General Relativity, just as words in the English language, infers a generalized or universal quality of relating which is dynamic. It’s not a static property of general related-ness, but rather it is an active responsiveness of all phenomena in relation to each other. The -ivity suffix of relativity treats relation as a verb, not a noun. What we observe is that in measurements where distance and time are precisely recorded, the classically held immutables of space and time actually bend and warp to reflect the presence of mass, gravity, and velocity. I think that this is what shocked the world about Einstein’s vision. He conceived that the metric itself, the abstract ‘rigid body’ of measurement which comprised the firmament of classical mechanics…that infinite set of Cartesian coordinates actually warped its contours around things, not the other way around. The plenum of space and time is only a measure of variations in scale and frequency among repeating effects that were happening to objects. The universe was not something happening in an empty box, it was boxing itself from the inside out. Special Relativity showed that the relativity of uniform motion observed by Galileo and the classical notion of invariant time had to be extended to accommodate the absoluteness of the speed of light. Einstein’s four dimensional space-time ‘mollusk’ describes what is understood to be an invariant space-time interval. Why is the speed of light absolute though? What mechanically makes time dilate or length contract? If my view is on the right track, the reason why the speed of light is absolute is because light is not a thing, it is the sensitivity of matter across its own created distance. The reason that Relativity works is because the universe makes sense of itself, and is ignorant of itself on every level. This is what relativity and perception are all about. It is interesting that the deepest truths of Einstein and the deepest truths of Quantum Mechanics both have to do explicitly with measurement. Einstein’s Relativities challenge common-sense notions of the separateness of space, time, matter, and energy, and of the nature of velocity while QM deals in probabilities and uncertainties associated with measurement of complementary variables (like position and momentum). We are talking about the limits of measure in both cases, and transcending immeasurable conditions with new strategies of measurement. To say that Relativity makes sense is accurate because we have an idea of what it means for things to make sense already. Knowledge is a validation of our public facing senses with private sense making, or vice versa. We model the movements of massive bodies in accord with Einstein’s curved space equations, but Einstein did not believe that space was literally curved, or that space was a thing at all. Curved space is a metaphor. What is curving is the statistical results of experiments where the behavior of matter in one frame is measured against the behavior of matter in another. This is the bare-metal reality of our observations. Physicists use instruments made of matter to cause and measure changes in matter. Through those measurements, we have inferred entities such as “energy”, “gravity”, “forces”, and “fields”, but we have only matter to tell us about them. Our perception relies on matter’s relation to matter, it’s relativity, to perceive conditions in remote inertial frames. This is not an endorsement of naive realism. Certainly it is useful to model energy as a separate entity from the matter which collects and projects it, however it remains impossible to inspect energy in public, without the aid of a material instrument such as our body, and a mode of perception to detect it and render it locally in some aesthetic modality. Perception is in one sense a mirror image of relativity, in that relativity is an impersonal view of public perspective and perception is a personal view of private relations. In another sense, perception is merely the private version relativity. The same principle which allows the coffee to stay in the cup on the train can be understood to be literally the same inertial principle which maintains the worldly realism of our experience. Inertia is the indifference of sense, the comfortable ranges and tropes which contrast with novelty and disturbance. By turning General Relativity around so that it can becomes Proprietary Relativity, a whole new way of making sense and measuring the immeasurable can be glimpsed. While it has always been implicit in the inertial frames and ‘observers’ of physics, the framing itself has never been examined properly, as far as I know. We take our own personal orientation for granted most of the time, (especially when we are overseeing an abstract equation or model of everythingness), but to model everythingness absolutely faithfully, we would need to include this very strange, but very ordinary state of affairs that we know as ‘being here’, or ‘our presence’; consciousness. It has been the hypothesis of MSR that as far as physics is concerned (which can only tolerate a very dim and narrow view of consciousness right now), the function of consciousness should be approached first as the minimum ingredient to provide the possibility of privacy, relativity, and inertia. A vector of orientation and perspective. This is the unspoken assumption of any observer or inertial frame, that somehow there has arisen a capacity to discern a here from a there, or a now from a then. MSR tries to explain the difference between (here, now) and (not-here, not-now) in terms of public and private ‘verses’. These verses are aesthetic contexts which provide mutual contrast for each other. It is the unfortunate complexity of the human experience, with its massively redundant population of historically recorded lifetimes, bodies, and bodies within bodies within bodies (organs, cells, molecules), which obscures the purity and simplicity of the private-public relation. It is not a dualistic relation however, it is a reflexive or Ouroboran relation. The private feelings and experiences of one inertial frame are the public bodies and energies of another, sufficiently alien frame. Having a body which is subject to conditions on the molecular, cellular, and somatic levels of public interaction gives us cause to think that these interactions are producing ‘us’, whereas my conjecture is that our bodies reflect the totality of our lives (and the lives of our entire species, of all life, and all phenomena dating back to before the dawn of life) from a particularly truncated and relativistic perspective. The body is a human life looking at itself askance through the narrow slit of its own relativistically disintegrated presence. This essential ingredient is the necessary piece to the puzzle. It allows us to recognize that this universe not only one of theres and thens, but of here and now. Einstein famously said that he did not understand now, and that makes sense since his is the perspective most grounded in the ‘other’ – in spacetime. Sense is not an abstract scalar quantity, property, or configuration, but it is the concretely real capacity to feel, sense, or detect, even though it is both non-local and non-non-local. It is not a field or an energy, an ether, an elan vital, or any other substantialized presence. That would be redundant, since sense is presence already. Just as Einstein relocated the universal process to electrodynamics rather than Newtonian mechanics, MSR relocates the electrodynamic process itself to a sensorydynamic milieu, a milieu which is absolute, and which presents uniqueness and originality as its product. In short, Multisense Realism posits an equivalence between locality and perception, and between perspective and equivalence/non-equivalence itself. Sense is how things seem to be, and seeming it turns out, can only be more fundamental than ‘reality’. The notion of inertia is expanded under MSR, so that it implies a tangible experience of expectation and continuity. Inertia is the sensory capacity of context and framing. This is the stuff of worldly realism. An accumulation of qualitative semi-signs and partial presentations which is beneath the formalism of literal semiotic signals. These fundamental references cannot arise purely from bottom up mathematical relations, but rather are recovered or discovered from the totality as a whole. This concept has been developed before many times, (e.g. Bohm’s Implicate Order, Sheldrake’s Morphic Resonance, Indra’s Net, etc) but generally with a holographic flavor of non-locality. Things simply have a way of coming around again and again. With the MSR concept of perceptual inertia, perception events are carved out of the monad of eternity. Personal perceptions are fundamentally voids, bubbles within the singularity which make it seem like a multiplicity from inside the bubble. Indeed, the bubble itself is the quality of seeming divided or disconnected, a finite flavor of here and now which is suspended in a frozen diaspora of theres and thens. “Laws” are the constraints which are experienced in one inertial frame because it is nested within an event which has already happened. A smaller now cannot escape from the experience which birthed it, in which the former becomes eternal and the latter becomes the instantaneous. Relativity, gravity, inertia, and perception are all different aspects of the same law-giving realism. Ratios borne of qualitative experience, and reborn through experience which has been condensed – quantitatively deferred.